The USA Science and Engineering Festival is coming up! The event kicks off with the 2018 X-STEM Symposium on Thursday, April 5. This conference-style "TED Talk"-like day is geared to engage middle and high school students with STEM professionals. Various presentations, live demonstrations, and hands-on experiences will include topics such as meteorology, Hollywood stunt science, neurobiology, and many more. At the end of the day, the participating STEM professionals hope that the students' interests are piqued in any of the many STEM career paths. This is a ticketed event from 9 a.m. to 3 p.m.
Attendees are asked to register ahead of the event. A sneak peek to the festival will occur Friday, April 6, when press, students, and military families can be the first to see the expo floor before it opens to the general public. 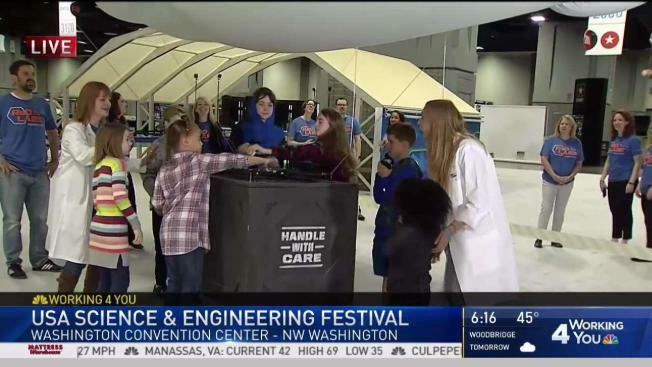 Pre-registration is required and the hours are 9 a.m. to 3 p.m.
Free to the public, the USA Science & Engineering Festival, presented by Lockheed Martin, will run Saturday, April 7 from 10 a.m. to 6 p.m. On Sunday, April 8 the expo opens at 10 a.m. and closes at 4 p.m. Both days will include appearances by special guests, stage shows, and more than 3,000 hands-on activities for all ages. Enter the FIRE LAB, explore the Moon with NASA's Luna Reconnaissance Orbiter, learn to code, meet Honda's ASIMO, travel across MARS, meet scientists and engineers,and visit the Ocean Pavilion where Danni Washington will be hosting. Engage your mind, be inspired, fuel your curiosity, and dive in to the all that the STEM world has to offer. For more information, visit usasciencefestival.org.